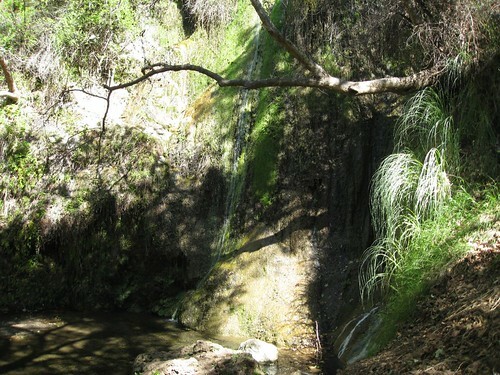 Yesterday Dave, I and Rigel hiked to Escondido Falls. It’s one of the few areas that allows dogs so we figured Rigel would like the adventure. To his great delight he discovered lizards, how to get incredibly muddy crossing streams, and how to scramble and climb like a little mountain goat. 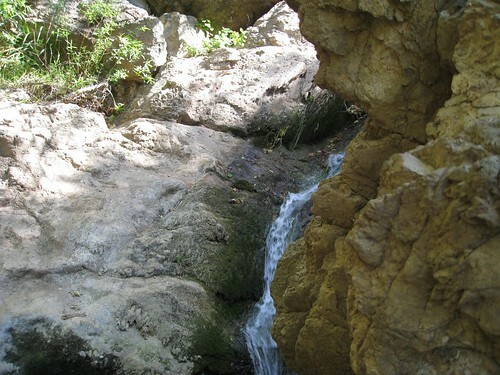 The above picture is from the base of the upper falls. I banged the hell out of my knee and fell into the water when trying to get to a boulder in the pool. My knee immediately swelled, throbbed, etc; it hurt so bad I almost vomited. As you can imagine it was not so fun getting back down from the upper falls at that point with an injury (requires a lot of scrambling, pulling yourself up/lowering yourself down etc: my pecs are actually a bit sore this morning). As my friends know I’m not the always the most stoic of people, but I do want to state I limped back with no complaints. I was actually VERY STOIC. Really. Afterwards we headed a bit further north to Leo Carrillo State Park & beach. They allow leashed dogs north of lifeguard station 3. Rigel’s only been to the beach a couple times because most of the beaches (including of course where we live) do not allow dogs. I wanted him to experience the waves and, more importantly, rinse off all the mud he’d collected. He seemed to like it overall — we just waded a bit in the surf. I really would like to start hiking & trail running Saturdays. There are a ton of hiking opportunities within an hour drive. We won’t always be able to bring Rigel, but I’d like to when we can.